← Making Housing Affordable Series. JOHN DALEY, BRENDAN COATES AND TRENT WILTSHIRE (1). Why should we care about housing affordability? Forever expanding supply on the urban fringe is unlikely to provide a solution to retreating affordability of home ownership. Housing needs to be expanded in those places where good jobs, services and infrastructure are. 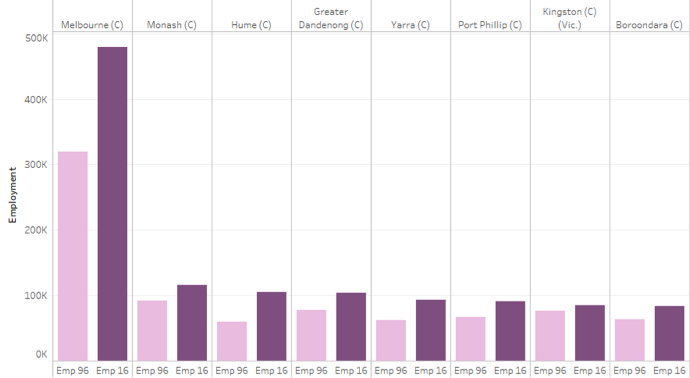 The inner and middle suburbs – where the good jobs and opportunities are – represent the major battle ground for NIMBY-ism. Thankfully, it is now widely understood that the ‘housing affordability crisis’ is a two-fold problem. One issue concerns the apparent declining access to home ownership on the part of millennials. The second issue is that a sizeable number of low and middle income households cannot afford to rent private housing without putting themselves into technical poverty or serious financial stress. The first problem concerns fairness in housing tenure, the second is to do with decent shelter for all Australians. Any discussion of the role of urban planning (and the politics associated with it) in respect of housing affordability should deal separately with these two issues. In terms of access to the traditional Australian expectation of home ownership, planning is often painted as the culprit – choking off the supply of housing and stoking price escalation. Planning certainly regulates supply, but simply boosting supply in aggregate is unlikely to make a dent in the presenting problem of diminished access to home ownership. 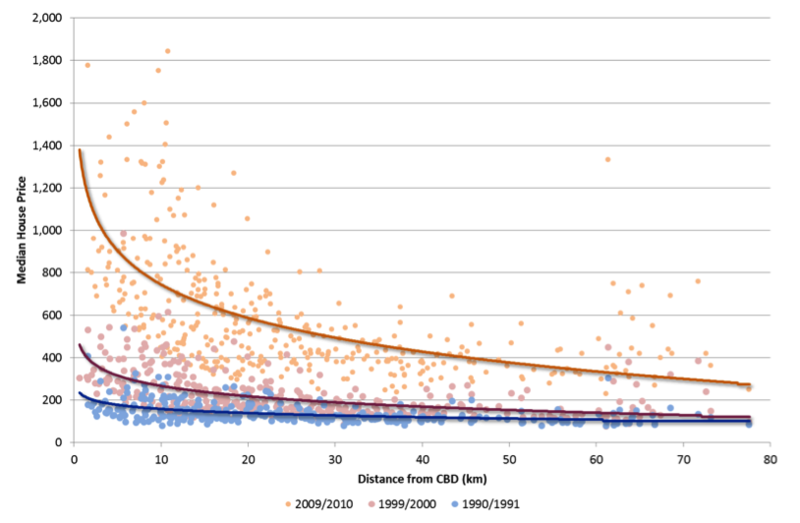 Most Australian metropolises now have oceans of land available at their outboard fringes available for development, notwithstanding notional urban growth boundaries. The constrained supply question needs to be understood in the context of structural changes in metropolitan economies. 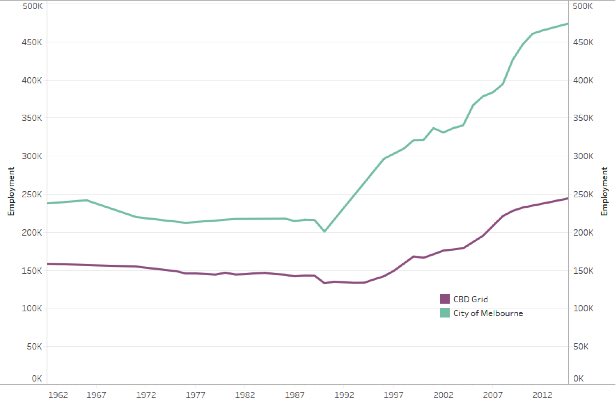 The shift to the services economy (as illustrated by changing GDP contributions in the Melbourne metropolitan area in the following figure) has meant that most new employment creation, other than that which is tethered to where households are located (e.g. retail, health, schools etc.) is in the inner city. Again, this is amply illustrated in the Melbourne experience as shown in Figure 2 and Figure 3. Many frustrated millennial households could secure home ownership in the outer growth areas but choose not to. For example, a couple comprising a registered nurse and a civil engineer on a combined income of $130,000 would have a good spread of purchase choices in newly developed suburbs. But taking up such an option would be a major risk, as it would compromise that household’s continuing access to jobs and opportunities, not only for themselves but for any children they might have. Moreover, because of relative price movements, buying in an outer area is likely to mean that the household will be unlikely to move inboard, towards areas of greater opportunity, in the future (see Figure 4). This is a dramatically different situation to that which prevailed during the long post-war boom, when suburban expansion offered both affordable housing and access to good jobs, and when purchasing in growth areas would assist rather diminish social mobility. So, forever expanding supply on the urban fringe is unlikely to provide a solution to retreating affordability of home ownership. And it would be destructive of the nation’s productivity by curtailing the development of human capital. Skills acquired through formal and on the job training would go undeveloped because of the limited pool of employment opportunities available to these areas. Housing needs to be expanded in those places where the good jobs are. Having said this, this is a necessary but not sufficient condition for improved access to home ownership. Other policy settings beyond the scope of this contribution – namely prudential lending controls and taxation reforms to counteract the effect of structurally low interest rates on housing prices – also need to be appropriately aligned. The inner and middle suburbs – where the good jobs and opportunities are – are, of course, the major battle ground for NIMBY-ism. It is hardly surprising that this is the case. It is entirely rational for incumbents in these markets to ‘pull up the draw bridge’ and maintain local housing scarcity once they have secured their own positions. And it is the job of local councils to represent local interests. Expecting Councillors to act in the best interests of the metropolis and housing affordability, if these objectives clash with local interests, is ultimately fanciful. Planning initiatives to open up vitally needed housing supply in these preferred locations typically fail miserably because of the inherently adverse politics. These initiatives include setting housing targets for Councils to achieve, establishment of ‘collaborative’ planning arrangements between state and local government to find opportunities for housing expansion, state government resumption of planning control over major sites or infill districts, creation of expert technical committees to (supposedly) take the politics out of development assessment and so on. One of the reasons why this problem seems so intractable is because planning, along with most things that state governments do, is a silo activity pursued with little or no appreciation of the micro-economics of regulation. In essence, planning represents a regulated market in development rights. Developers are not permitted to do what they like when they like. We regulate development, which means erecting barriers to entry to certain market activities in a considered way, because we get a more efficient (welfare enhancing) allocation of resources compared to what would happen in a laissez faire market. Every time a development approval is issued by a council or other planning authority, a proponent is effectively licenced to undertake a regulated business activity. 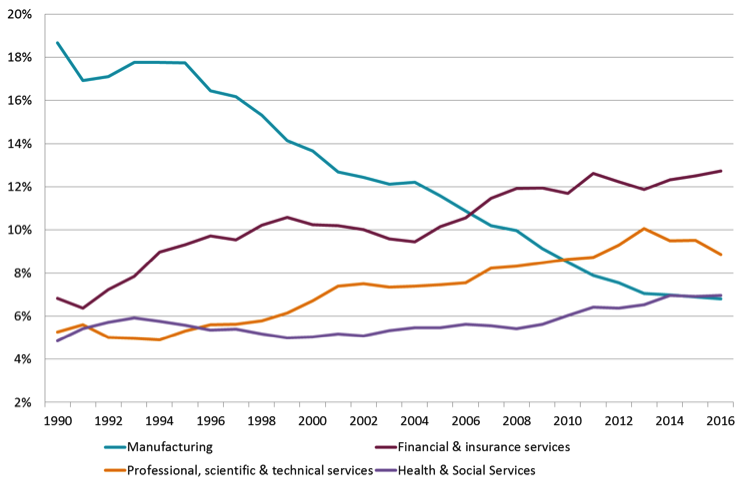 In all other markets regulated by governments in the interests of community welfare – liquor licensing, commercial fisheries, milling of timber from state forests, mineral exploration, broadcast band allocation and trading concessions in the public realm to mention a few – governments typically take a licence fee commensurate with the value of the business access that is granted. In planning, there is generally no explicit licence fee. Rather the owner of the development site in question enjoys an uplift in the value of their property commensurate with the residual after the developer has met their profit target and all construction and delivery costs, including development contributions for roads, parks, community facilities and so on. Aside from the inherent unfairness in the community ‘giving away’ the value that it enables through planning and the associated investment in urban infrastructure and amenity, this lack of a licence fee in planning exacerbates the housing supply problem in the inner and middle suburbs in particular. Approval authorities inject greater complexity and negotiation opportunities into their planning controls partly to give themselves a chance to extract some value for their communities, that is, a share of the value uplift they see themselves creating. This opacity and uncertainty helps to choke off otherwise warranted investment in housing. The dynamics and atmospherics of planning and NIMBYism in these preferred areas could change significantly if development licence fees were systematically levied at a rate that both left enough on the table for land owners to release their land to bona fide developers and enabled these developers to meet their costs and reasonable profit targets. Were the proceeds of these licence fees to be shared with local Councils for use in discretionary spending on infrastructure and services for the local community, Councils would have a stake in promoting rather than opposing development. The ACT Government currently applies an effective development licence fee through its Change of Use Charges scheme. Under the Territory’s leasehold land tenure system, developers must not only secure town planning approvals, they are required to pay the government for the adjustment to the lease terms on the site to enable a higher value use. In principle, this mechanism can be replicated in a freehold tenure system. In terms of the second dimension of the twofold problem introduced at the head of this discussion, planning must, again, play its role but it is not sufficient by itself to ensure that all low and middle income Australians have access to decent housing at a rent they can afford. Governments need to provide equity for investment in social and affordable housing, as well as finding ways of topping up returns for private investors willing to enter long term contracts to provide affordable rental housing. And Governments need to continue to assist on the demand side by supplementing the capacity to pay rent by lower income households. Planning’s contribution could include assigning some of the proceeds of value uplift enabled by development approvals and infrastructure investments to the provision of social and affordable housing. Both the Victorian and NSW Governments have recently foreshadowed policies requiring the provision of permanently affordable housing when land is up-zoned. This is a good start. Beyond value capture, inclusionary zoning policies can be applied. These are premised on the argument that planning should be concerned with sustainable development broadly defined, that is, to include social sustainability as well as in respect of the natural and built environment. Through this lens, incremental development which does not include a hard-wired quantum of social and affordable housing could not be seen to be sustainable any more than incremental development without contributions to open space, maintenance of local heritage value and application of water sensitive urban development principles. An inclusionary zoning scheme based on this idea has been operating successfully in Sydney’s Ultimo Pyrmont regeneration precinct for more than 25 years. It is surprising that it has not spread further. This entry was posted in Housing, SERIES: Making housing affordable and tagged inclusionary zoning., licensed development rights, Making Housing Affordable series, Marcus Spiller, NIMBYism, urban planning, value capture. Bookmark the permalink. LVT would over time impact on access to land, using affordability and the dangerous growth of inequality. You do write of Development Licence Fees and Value capture but in my option these are complicated ways of retuning to the community value which the community has created in comparison with LVT – and the complication is fertile ground for corruption and ‘mates’ profit opportunities. Of course the political difficulties of LVT are immense because it is the ‘big end of town’ that would be paying heavily AND proportionally, for the value the community gives and maintains for their land. In passing, Henry George, a great advocate of LVT, in the chapter on how civilisations may collapse in Progress and Poverty, observed that democracy produces better outcomes the more equal a society is – but giving votes to people who are excluded, exploited, denied opportunities etc will surely resulted in the election of despots. There seem to be a few examples of this happening!